In about 27 hours, I’ll toe the line for my third marathon. I’m not quite sure what to think. I should be nervous, but I’m not. Excited – yes, but not nervous. I have no idea what to expect out of this race. My original goal was to build on the fitness of my 50k in August. I’d add some speed work, keep hammering away at the long runs and go out and break 4 hours for the first time. Instead I fought through a couple of running funks, where I couldn’t get out the door to run in the morning. They each went on for days. I ran a couple of 20 milers and lots of 10 milers, but nothing really in between. I have no idea what to expect on Sunday. At least from a time standpoint – I don’t know what to expect. I do expect to have fun. In the end, it’s about enjoying the experience. I remember back to my first marathon (Kalamazoo last year) – jogging ever so slowly to the finish line. I’d injured myself about a month and a half prior to the race and basically hadn’t run since then. Less than a mile into the race my knee was in pain, but I pushed on. I must’ve been favoring that leg because about 16 miles in the other, non-injured, leg seized up. The muscles in the calf, hamstring and quad all locked up. They were done. But I wasn’t. I stretched it out awhile and walked for a bit and alternated between a job and walk for the next 10 miles. It seemed agonizingly slow at times, but I wasn’t going to give up. Apparently I looked so bad that when I passed my dad and brother, who were out there to cheer me on, they were trying to decide between them who’d tell me that I should pack it and call it a day. Fortunately neither one of them suggested it. When I crossed the finish line, I remember my eyes tearing up just a bit. I’d made it. I didn’t care what my time was, only happy that I’d finished. It was an epic experience, and before they put the finishers medal around my neck, I knew I was going to do another one. Even though I was in pain for the entire race, and had to walk more than I ever thought I’d have to walk, I truly enjoyed the entire experience. I’m still going to chase that 4hr mark on Sunday, but even if I miss it, I expect to have fun, enjoy the race and the beauty that is Michigan in the fall. Oh, and the beer tent – that should be fun too! 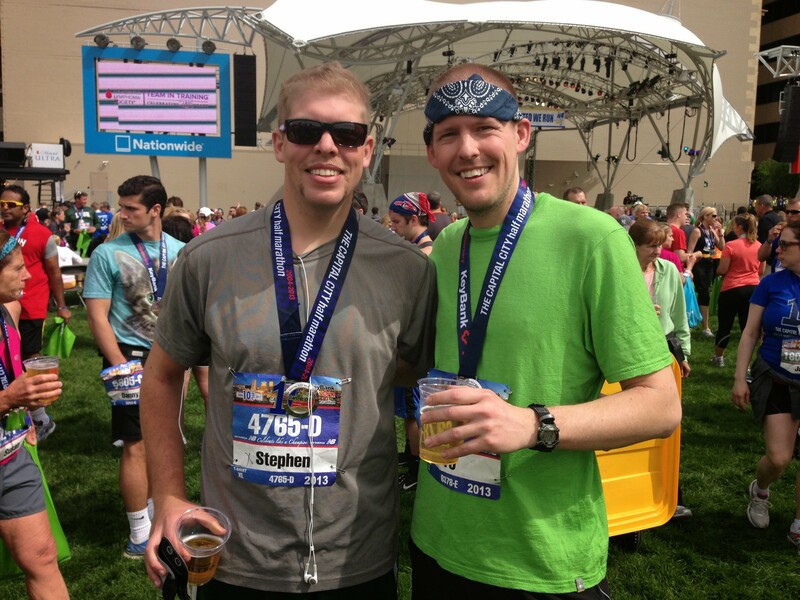 This entry was posted in Racing and tagged beer, marathon, training on October 17, 2015 by darkskyrunner.